For other uses, see Przemyśl (disambiguation). Przemyśl ([ˈpʂɛmɨɕl] ( listen) German: Premissel, Ukrainian: Peremyshl, Перемишль less often Перемишель) is a city in south-eastern Poland with 66,756 inhabitants, as of June 2009. In 1999, it became part of the Subcarpathian Voivodeship; it was previously the capital of Przemyśl Voivodeship. Przemyśl owes its long and rich history to the advantages of its geographic location. The city lies in an area connecting mountains and lowlands known as the Przemyśl Gate, with open lines of transportation, and fertile soil. It also lies on the navigable San River. Important trade routes that connect Central Europe from Przemyśl ensure the city's importance. Different names in various languages have identified the city throughout its history. Selected languages include: Bulgarian: Пшемишъл (Pshemishǎl); Czech: Přemyšl; German: Premissel; Latin: Premislia; Ukrainian: Перемишль (Peremyshlj); and Yiddish: פּשעמישל‎ (Pshemishl). Przemyśl, the second-oldest city in southern Poland (after Kraków), appears to date from as early as the 8th century. The region subsequently became part of the 9th-century Great Moravian state. Archeological remains testify to the presence of a monastic settlement as early as the 9th century. Przemyśl was one of the main strongholds of the Lendians (Lendizi). Upon the invasion of the Hungarian tribes into the heart of the Great Moravian Empire around 899, the Lendians of the area declared allegiance to the Hungarian authorities. The Przemyśl region then became a site of contention between Poland, Kievan Rus and Hungary beginning in at least the 9th century. The area was mentioned for the first time in 981 by Nestor, when Vladimir I of Kievan Rus took it over on the way into Poland. In 1018 Przemyśl returned to Poland, and in 1031 it was retaken by Rus. The palatium complex was built during the rule of Bolesław I Chrobry. Between the 11th and 12th century the city was a capital of the Principality of Peremyshl, one of the principalities comprising the Kievan Rus' state. Sometime before 1218 an Eastern Orthodox eparchy was founded in the city. Przemyśl later became part of the Kingdom of Galicia–Volhynia. In 1340 Przemyśl was taken by Casimir III of Poland and became part of the Polish kingdom as result of the Galicia–Volhynia Wars. Around this time the first Roman Catholic diocese was founded in the city, and Przemyśl was granted city rights based on Magdeburg rights, confirmed in 1389 by king Władysław II Jagiełło. The city prospered as an important trade centre during the Renaissance period. Like nearby Lviv (Polish: Lwów, German: Lemberg), the city's population consisted of a great number of nationalities, including Poles, Ruthenians, Jews, Germans, Czechs and Armenians. The long period of prosperity enabled the construction of such handsome public buildings as the Old Synagogue of 1559. A Jesuit college was founded in the city in 1617. The prosperity came to an end in the middle of the 17th century, due to wartime destruction during The Deluge and the general decline of the Polish–Lithuanian Commonwealth at this time. The city decline lasted for over a hundred years, and only at the end of the 18th century did it recover its former levels of population. In 1754, the Roman Catholic bishop founded Przemyśl's first public library, which was only the second public library in the Polish–Lithuanian Commonwealth (Warsaw's Załuski Library was founded 7 years earlier). Przemyśl's importance at that time was such that when Austria annexed eastern Galicia in 1772 the Austrians considered making Przemyśl their provincial capital, before deciding on Lwów. In the mid-eighteenth century, Jews constituted 55.6% (1692) of the population, Roman Catholics 39.5% (1202), and Greek Catholics 4.8% (147). In 1772, as a consequence of the First Partition of Poland, Przemyśl became part of the Austrian empire, in what the Austrians called the Kingdom of Galicia and Lodomeria. According to the Austrian census of 1830, the city was home to 7,538 people of whom 1,508 (20%) were members of the Greek Catholic Church, a significantly larger number of Ruthenians than in most Galician cities. In 1804 a Ruthenian library was established in Przemyśl. By 1822 its collection had over 33,000 books and its importance for Ruthenians was comparable to that held by the Ossolineum library in Lviv for Poles. Przemyśl also became the center of the revival of Byzantine choral music in the Greek Catholic Church. Until eclipsed by Lviv in the 1830s, Przemyśl was the most important city in the Ruthenian cultural awakening in the nineteenth century. In 1861 the Galician Railway of Archduke Charles Louis was built connecting Przemyśl with Kraków to the west and Lviv (Lemberg) to the east. In the middle of the 19th century, due to the growing conflict between Austria and Russia over the Balkans, Austria grew more mindful of Przemyśl's strategic location near the border with the Russian Empire. During the Crimean War, when tensions mounted between Russia and Austria, a series of massive fortresses, 15 km (9 mi) in circumference, were built around the city by the Austrians. The census of 1910 showed that the city had 54,078 residents. Roman Catholics were the most numerous – 25,306 (46,8%), followed by Jews – 16,062 (29,7%) and Greek Catholics – 12,018 (22,2%). With technological progress in artillery during the second half of the 19th century, the old fortifications rapidly became obsolete. The longer range of rifled artillery necessitated the redesign of fortresses so that they would be larger and able to resist the newly available guns. To achieve this, between the years 1888 and 1914 Przemyśl was turned into a first class fortress, the third largest in Europe out of about 200 that were built in this period. Around the city, in a circle of circumference 45 km (28 mi), 44 forts of various sizes were built. The older fortifications were modernised to provide the fortress with an internal defence ring. The fortress was designed to accommodate 85,000 soldiers and 956 cannons of all sorts, although eventually 120,000 soldiers were garrisoned there. German illustration of the second Siege of Przemyśl, from the 13 January 1915 Illustrated War News. In August 1914, at the start of the First World War, Russian forces defeated Austro-Hungarian forces in the opening engagements and advanced rapidly into Galicia. The Przemyśl fortress fulfilled its mission very effectively, helping to stop a 300,000 strong Russian army advancing upon the Carpathian Passes and Kraków, the Lesser Poland regional capital. The first siege was lifted by a temporary Austro-Hungarian advance. However, the Russian army resumed its advance and initiated a second siege of the fortress of Przemyśl in October 1914. This time relief attempts were unsuccessful. Due to lack of food and exhaustion of its defenders, the fortress surrendered on 22 March 1915. The Russians captured 126,000 prisoners and 700 big guns. Before surrender, the complete destruction of all fortifications was carried out. The Russians did not linger in Przemyśl. A renewed offensive by the Central Powers recaptured the destroyed fortress on 3 June 1915. During the fighting around Przemyśl, both sides lost up to 115,000 killed, wounded, and missing. At the end of World War I, Przemyśl became disputed between renascent Poland and the West Ukrainian People's Republic. On 1 November 1918 a local provisional government was formed with representatives of Polish, Jewish, and Ruthenian inhabitants of the area. However, on 3 November, Ukrainian military unit overthrew the government, arrested its leader, and captured the eastern part of the city. The Ukrainian army was checked by a small Polish self-defence unit formed of World War I veterans. Also numerous young Polish volunteers from Przemyśl's high schools, later to be known as Przemyśl Orlęta, The Eaglets of Przemyśl (in a similar manner to more famous Lwów Eaglets), joined the host. The battlefront divided the city along the river San, with the western borough of Zasanie held in Polish hands and the Old Town controlled by the Ukrainians. Neither Poles nor Ukrainians could effectively cross the San, so both opposing parties decided to wait for a relief force from the outside. That race was won by the Polish relievers: the volunteer expeditionary unit formed in Kraków arrived in Przemyśl on 10 November. When the subsequent Polish ultimatum to the Ukrainians remained unanswered, on 11–12 November the Polish forces crossed the San and forced out the outnumbered Ukrainians from the city in what became known as the 1918 Battle of Przemyśl. After the end of the Polish–Ukrainian War and the Polish–Bolshevik War that followed, the city became a part of the Second Polish Republic. Although the capital of the voivodship was in Lwów (see: Lwów Voivodeship), Przemyśl recovered its nodal position as a seat of local church administration, as well as the garrison of the 10th Military District of the Polish Army - a staff unit charged with organising the defence of roughly 10% of the territory of prewar Poland. As of 1931 Przemyśl had a population of 62,272 and was the biggest city in southern Poland located between Kraków and Lwów. During the invasion of Poland the German and Polish armies fought the Battle of Przemyśl in and around the city. The four-day battle was followed by three days of massacres carried out by the German soldiers and police against hundreds of Jews who lived in the city. In total over 500 Jews were murdered in and around the city and the vast majority of the city's Jewish population was deported across the San River into the portion of Poland that was occupied by the Soviet Union. The border between the two invaders ran through the middle of the city along the San River until June 1941. During the Soviet occupation Przemyśl was incorporated to the Ukrainian SSR in the atmosphere of NKVD terror as thousands of Jews were ordered to be deported. It became part of the newly established Drohobych Oblast. In 1940 the city became an administrative center of Peremyshl Uyezd with the Peremyshl Fortified District established along the Nazi-Soviet frontier before the German attack against the USSR in 1941. The town's population increased due to a large influx of Jewish refugees from the General Government who sought to cross the border to Romania. It is estimated that by mid-1941 the Jewish population of the city had grown to roughly 16,500. In the Operation Barbarossa of 1941, the eastern (Soviet) part of the city was also occupied by Germany. On 20 June 1942 the first group of 1,000 Jews was transported from the Przemyśl area to the Janowska concentration camp, and on 15 July 1942 a Nazi ghetto was established for all Jewish inhabitants of Przemyśl and its vicinity – some 22,000 people altogether. Local Jews were given 24 hours to enter the Ghetto. Jewish communal buildings, including the Tempel Synagogue and the Old Synagogue were destroyed; the New Synagogue, Zasanie Synagogue, and all commercial and residential real estate belonging to Jews were expropriated. The ghetto in Przemyśl was sealed off from the outside on 14 July 1942. By that time, there may have been as many as 24,000 Jews in the ghetto. On 27 July the Gestapo notified Judenrat about the forced resettlement program and posted notices that an "Aktion" (roundup for deportation to camps) was to be implemented involving almost all occupants. Exceptions were made for some essential, and Gestapo workers, who would have their papers stamped accordingly. On the same day, Major Max Liedtke, military commander of Przemyśl, ordered his troops to seize the bridge across the San river that connected the divided city, and halt the evacuation. The Gestapo were forced to give him permission to retain the workers performing service for the Wehrmacht (up to 100 Jews with families). For the actions undertaken by Liedtke and his adjutant Albert Battel in Przemyśl, Yad Vashem later named them "Righteous Among the Nations". The process of extermination of the Jews resumed thereafter. Until September 1943 almost all Jews were sent to the Auschwitz or Belzec extermination camps. The local branches of the Polish underground and the Żegota managed to save 415 Jews. According to a postwar investigation in German archives, 568 Poles were executed by the Germans for sheltering Jews in the area of Przemyśl, including Michał Kruk, hanged along with several others on 6 September 1943 in a public execution. Among the many Polish rescuers there, were the Banasiewicz, Kurpiel, Kuszek, Lewandowski, and Podgórski families. The Red Army retook the town from German forces on 27 July 1944. On 16 August 1945, a border agreement between the government of the Soviet Union and the Polish Provisional Government of National Unity, installed by the Soviets, was signed in Moscow. According to the so-called Curzon Line, the postwar eastern border of Poland has been established several kilometres to the east of Przemyśl. 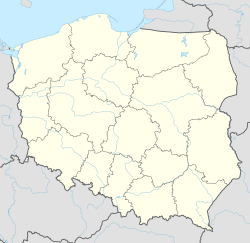 In the postwar territorial settlement, the new border between Poland and the Soviet Union placed Przemyśl just within the Polish People's Republic. The border now ran only a few kilometers to the east of the city, cutting it off from much of its economic hinterland. Due to the murder of Jews in the Nazi Holocaust and the postwar expulsion of Ukrainians (in 1947's Operation Vistula or akcja Wisla), the city's population fell to 24,000, almost entirely Polish. However, the city welcomed thousands of Polish migrants from Eastern Galicia. Their numbers restored the population to its prewar level. As a result of all these events, the growth of the city in the years after 1945 was stunted. In the 1990s, economic reforms in Ukraine after the fall of the Soviet Union allowed the border to be opened, improving the city's opportunities for trade. Muzeum Narodowe (the National Museum) - this has a splendid collection of icons, second only to the one in Sanok. It is free on Wednesdays. Muzeum Dzwonów i Fajek (the Museum of Bells and Pipes) - free on Wednesdays. Castle, built by Casimir III the Great in the 14th century. Lubomirski Palace, an eclectic style palace of the Lubomirski family constructed in 1885. Kopiec Tatarski - a mound to the south of the city where a 16th-century Tatar khan was supposedly buried. The Tatarska Góra TV tower is built on the mound. ^ "Population. Size and structure by territorial division" (PDF). © 1995-2009 Central Statistical Office 00-925 Warsaw, Al. Niepodległości 208. 2009-06-02. Retrieved 2009-06-22. ^ Poleski, Jacek (2000). "Naszacowice". In Wieczorek, Alfried; Hinz, Hans-Martin (eds.). Europe's Centre Around AD 1000. Theiss. p. 175. ISBN 978-3806215496. ^ Under 981, the Primary Chronicle reports on Volodymyr's campaign against the Poles, which resulted in the capture of "their towns" Peremyshl and Cherven. As the chronicler notes, they remained under Rus' control until his own time. In: S. Plokhy. "The origins of the Slavic nations: premodern identities in Russia, Ukraine, Belarus". Cambridge University Press, 2006. p. 57. ^ Przemysław Wiszewski. Domus Bolezlai: Values and Social Identity in Dynastic Traditions of Medieval Poland (c. 966-1138). BRILL. 2010. p. 445. ^ a b Tom Idzikowski. "The History of the Construction of the Fortress of Przemyśl". Engagements and Battles. Austro-Hungarian-army.co.uk. Retrieved May 23, 2012. ^ Koval, M. Unknown Ukraine: 20th century history of fortifications. Myths and reality. ^ Encyclopedia of the Ghettos (2016). "סמבּוֹר (Sambor) המכון הבין-לאומי לחקר השואה - יד ושם:". The International Institute for Holocaust Research. ^ Virtual Shtetl (2016). "Jewish history of Przemyśl. The Holocaust". POLIN Museum of the History of Polish Jews. Archived from the original on 2016-09-14. ^ Daniel Fraenkel. "Akte 1979. Battel, Albert. Die deutschen Gerechten". Deutsche und Österreicher. Wallstein Verlag. pp. 65–. Retrieved May 23, 2012. ^ "Average Conditions Przemyśl, Poland". BBC Weather. Archived from the original on July 26, 2009. Retrieved August 30, 2010. ^ "Schron Kierowania Obroną Cywilną - Visit Przemyśl". visit.przemysl.pl (in Polish). Retrieved 2017-07-26. Wikimedia Commons has media related to Przemyśl. Wikivoyage has a travel guide for Przemyśl. Wikisource has the text of the 1911 Encyclopædia Britannica article Przemyśl. This page was last edited on 13 February 2019, at 14:35 (UTC).